ADA Oral Pathologist is a chair-side reference to oral pathology conditions that can assist dentists with formulating diagnoses. Dr. Michael Kahn, chairman and tenured professor of the Department of Oral and Maxillofacial Pathology at Tufts University School of Dental Medicine, wrote and developed content for the app. Conditions can be searched by name or by entering clinical observations. 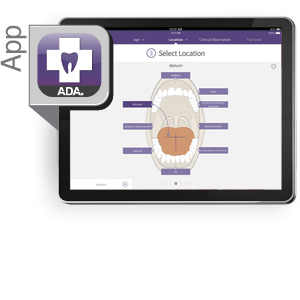 ADA Oral Pathologist is a reference you can use every day, with photos and descriptions of the most common oral pathology conditions seen in your patients. Search over 200 conditions. For additional details and instructions on ordering the app click on the Sample icon above.